I still can’t believe school is starting again. I know that in some states school has begun but here in New York it starts next week. Summer is practically gone and now it’s time to wake up early, help the kids with homework and take them to their after school activities. My daughter already told me that she wants to start ballet classes with her little sister, so I will have a very busy school year. Not to mention I will be starting school aswell, which adds more chaos to my already chaotic life. I am in serious need of quick and simple dinner ideas that are effortless to make. Thank goodness for Walmart for making dinner time fast and stress free. Walmart offers great options for back-to-school meals for parents like me and you who are busy and always on the go. You can easily pick up their fully cooked marketside Rotisserie chicken and create an easy and effortless meal around it. I also picked up their coleslaw and macaroni salad, I honestly couldn’t resists the urge and plus it comes in a combo. You can either get the rotisserie chicken or their marketside pizza with a side and your favorite CocaCola drink, all for under $10. If you decide to purchase the marketside pizza you can grill it or bake it, however you want and you know it will taste good. I mean who doesn’t like pizza? What else hits the spot more than a cold, icy Coca cola drink, that goes perfect with any meal. I honestly think that if you are eating pizza you have to drink CocaCola, I’m just saying. It’s a match made in heaven,well that’s what me and my hubby think anyway, haha! ¡Feliz martes!Todavía no puedo creer que la escuela está empezando de nuevo. Sé que en algunos estados la escuela ha comenzado, pero aquí en Nueva York comienza la próxima semana. El verano prácticamentese ha acabado y ahora es el momento de levantarse temprano, ayudar a sus hijos con la tarea y llevarlos a su actividades después de clases. Mi hija ya me dijo que ella quiere empezar clases de ballet con su hermana pequeña, así que voy a tener un año escolar muy ocupado. Por no hablar voy a empezar la escuela también, lo que añade más caos a mi vida ya caótica. Estoy en grave necesidad de ideas de la cena rápidas y sencillas y sin esfuerzo en hacer. Gracias a Dios por Walmart para hacer la hora de comer rápido y libre de estrés. 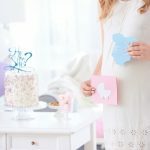 Walmart ofrece grandes opciones para las comidas para el regreso a la escuela para los padres como yo y tu que están ocupados y siempre en movimiento. Usted puede fácilmente recogerun completamente cocido pollo Rotisserie y crear una comida fácil y sin esfuerzo. También tomé la ensalada de repollo y macarrones, Sinceramente, no podía resistir la tentación y ademas viene en un combo. Puedes comprar el pollo o la pizza con una de las ensaladas y tu bebida favorite de CocaCola, todo por menos de $10. Si usted compra la pizzas en el lado del mercado puedes ponerlo ala parrilla o al horno, aquien no le gusta la pizza?. 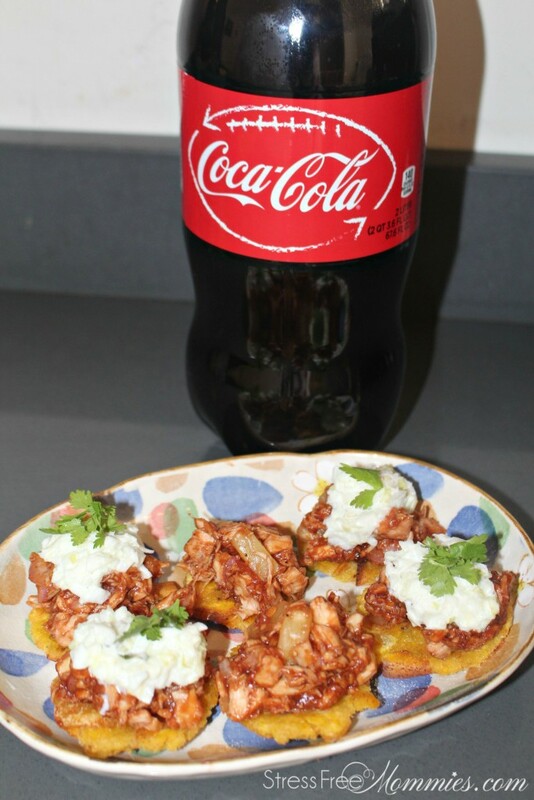 Lo que cae muy bien con cualquier comida es un frío, y helado bebida de cola Coca, sinceramente creo que si vas a comer pizza tienes que beber Coca-Cola, sólo estoy diciendo. Bueno, eso es lo que yo y mi marido pensamos jaja! Back-to-school for me means having a routine, you know your kids get home from school, they do their homework, they eat, then they take a bath and before you know it, it’s bedtime. 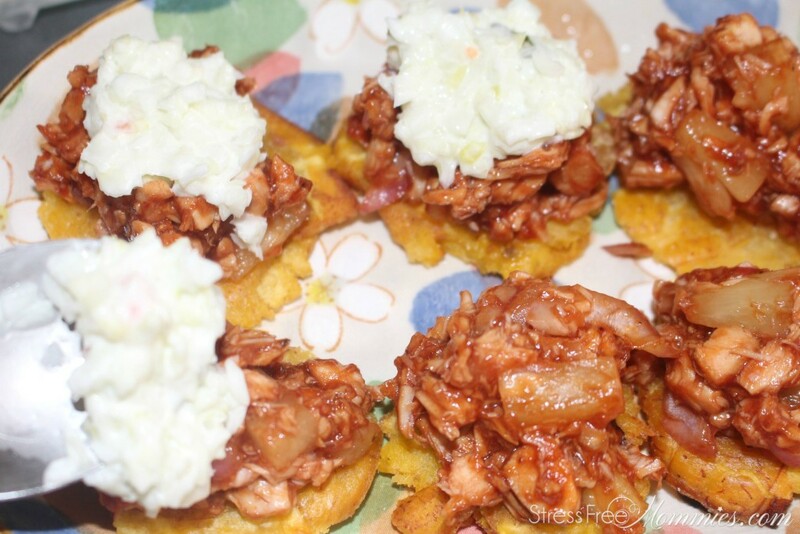 So I try to make the most of it by creating a delicious and effortless meal like my tostones with BBQ chicken and Coleslaw. 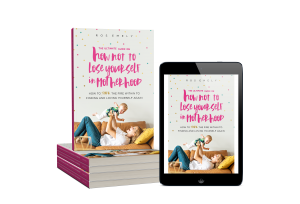 I am telling you, it will take you no time in making it and you are going to spend more time with your hubby and kids, rather than slaving in the kitchen. Now that’s my kind of day. 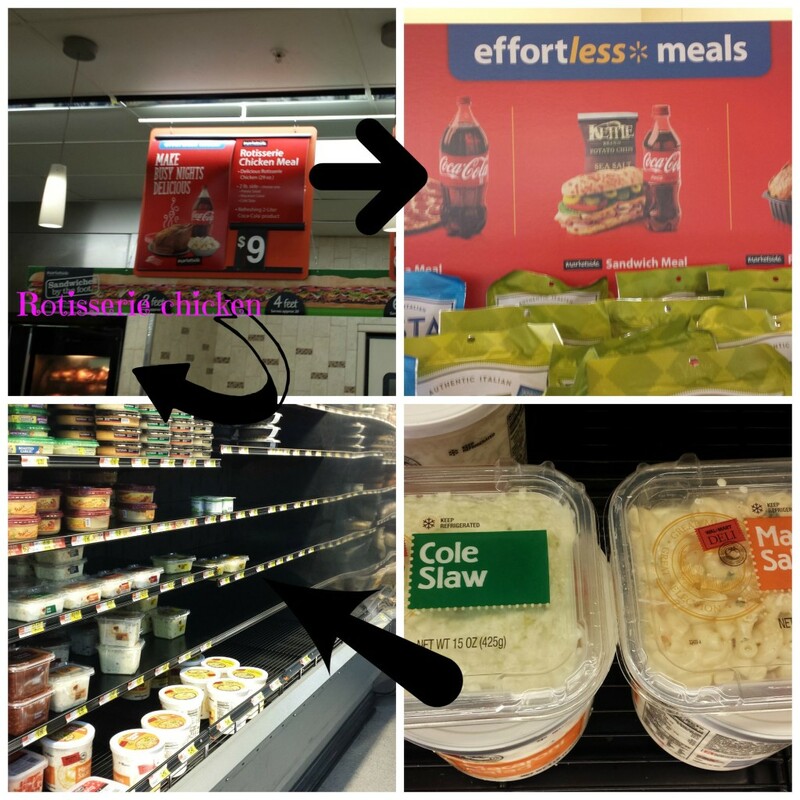 As soon as I stepped in to my local Walmart store I see the signage that says “effortless meals” which is so easy to locate, it’s right on the Deli side. Tan pronto entro en la tienda local de Walmart veo la señalización que es tan fácil de encontrar, está justo en el lado del Deli. Que no se pierde “comidas sin esfuerzo” señalización. To make my tostones with BBQ chicken and Cole slaw recipe, you first need to peal and cut the green plantain into pieces. 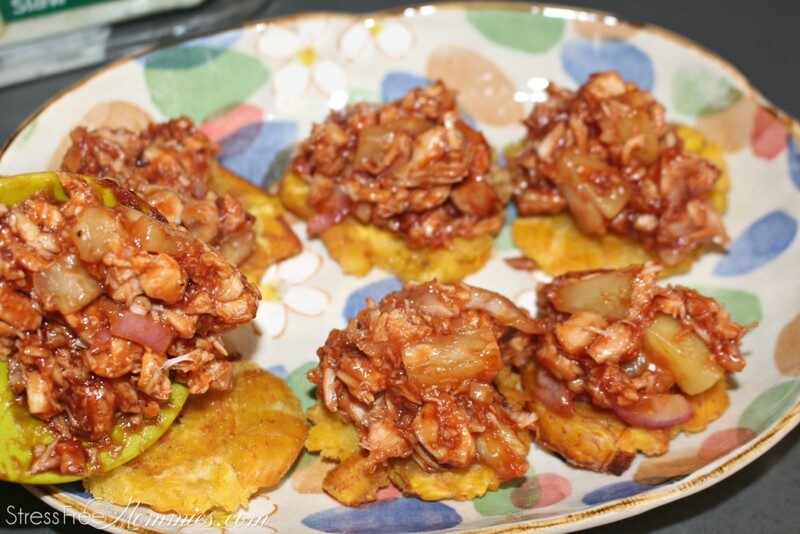 Para hacer mi receta de tostones con pollo a la barbacoa y ensalada de repollo, primero pelar la cascara del platano y cortar en pedazos. 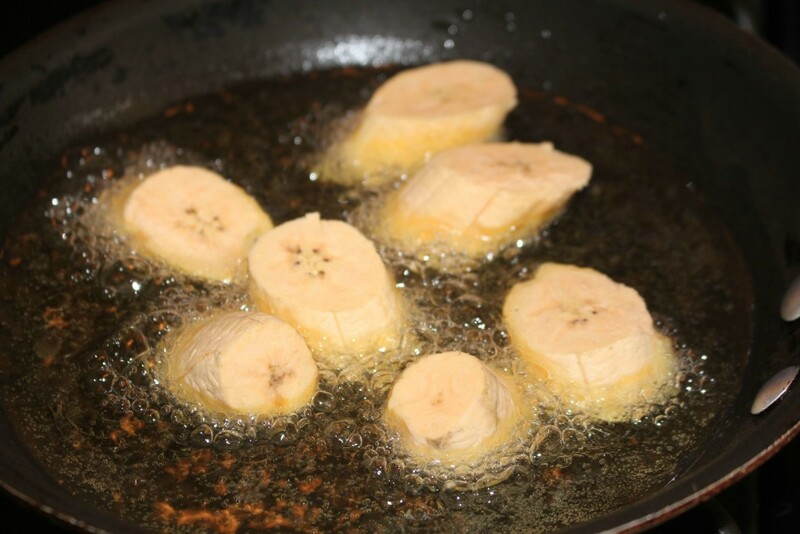 Fry the plantains on both sides. Freir los platanos en ambos lados. Mash each plantain with a plantain masher, if you do not have one, you can use the bottom of any bottle that has a flat and round surface. Maje cada plátano con un majador de plátano, si usted no tiene uno, puede utilizar la parte inferior de cualquier botella que tiene una superficie plana redonda. 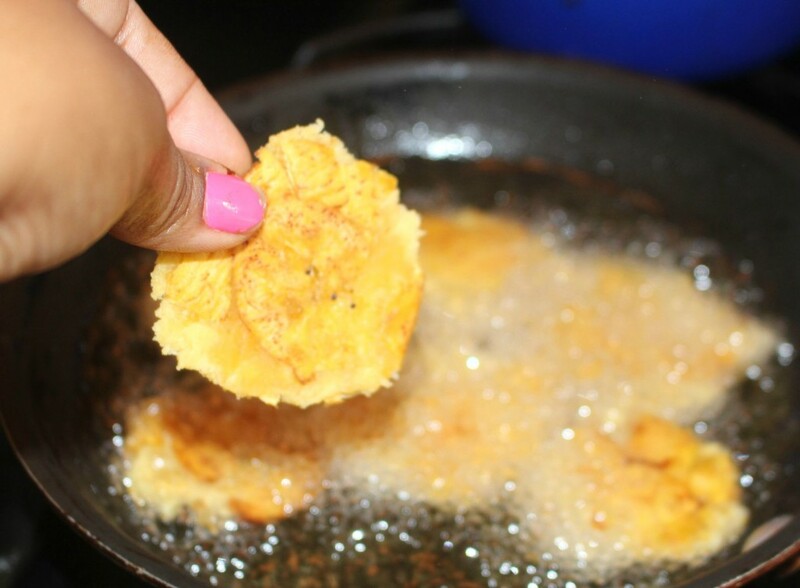 Fry the plantains again because when making tostones, you have to double fry it. Freir los platanos de nuevo, porque cuando se hace tostones hay que freirlos dos veces. After you fry both sides for a couple of seconds on each side, it’s time to shred the rotisserie chicken and place it in a pan on medium heat. Despues de freir el platano por unos segundos, hay que desmechar el pollo y calentarlo en un sarten en fuego medio alto. 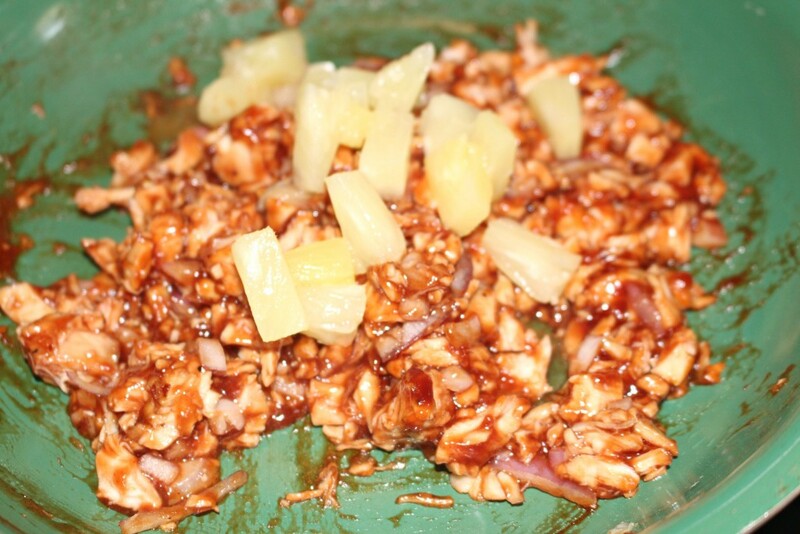 Add your favorite BBQ sauce and for a sweet touch add pineapple chunks(can or fresh) and also add some red onions (optional). I love it! Agregue su salsa BBQ favorite y para darle un toque dulce agregue tambien pedasitos de piña (de lata o natural) y despues agregue cebollitas rojas. Me encanta! 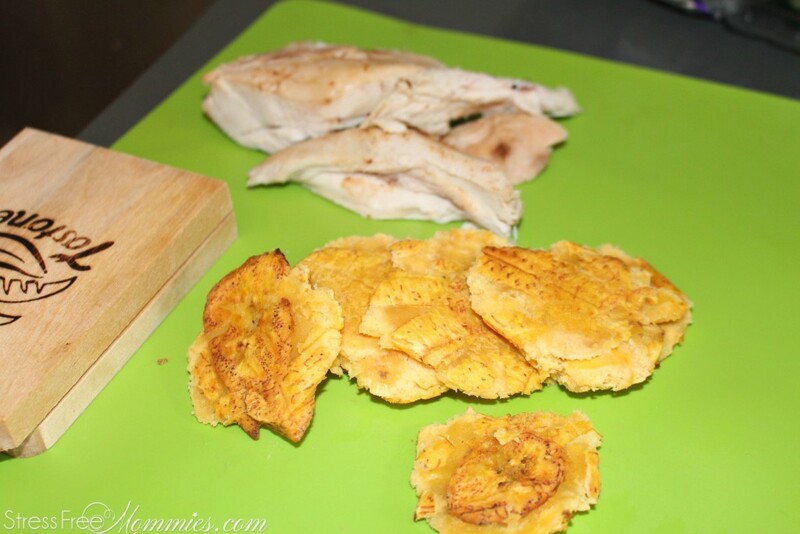 Now it’s time to assemble our delicious and tender chicken on top of the tostones. My mouth is watering. 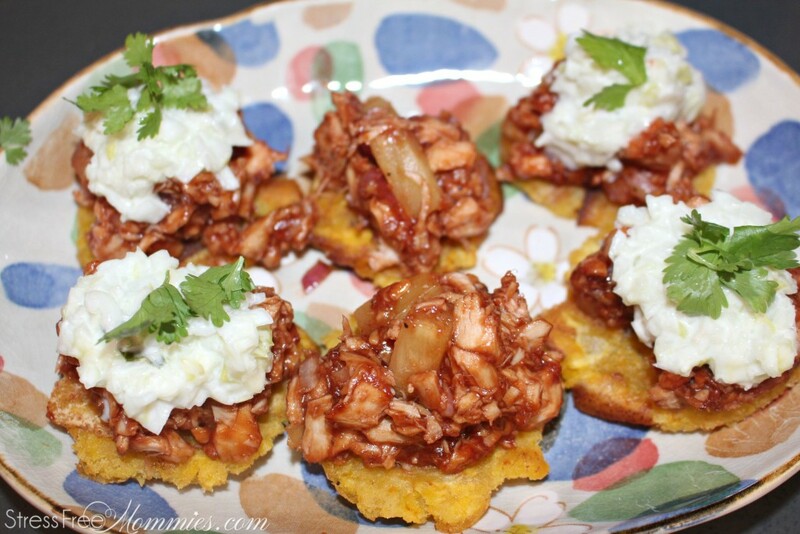 Ahora es hora de poner el pollo delicioso encima de los tostones. Mi boca se hace agua. Do not forget the marketside coleslaw that I also picked up at Walmart, it adds crunch and “what is that?” factor to the dish. I am in love with this effortless meal and you know what? my family loved it so much that I will be making more this weekend. My hubby showed a picture to his “boys” and they all complemented me on it, that I dared to make them some. 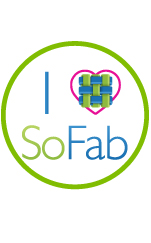 I did and they loved it! haha! My hubby also shared with them that the chicken was from Walmart and they couldn’t believe how juicy and tender it was. Estoy enamorada de esta comida sin esfuerzo y ¿sabes qué? mi familia le encantó tanto que voy a hacer más este fin de semana. Mi esposo le mostró una foto a sus “amigos” y todos me complementaron sobre la comida, me atreví a hacerles tambien. Lo hice y les encantó! ¡haha! Mi marido compartío con ellos que el pollo era de Walmart y no podían creer lo jugoso y tierno que era. 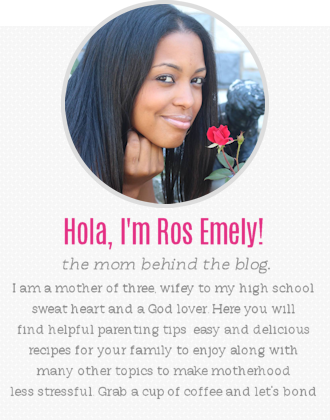 I hope you give this delicious recipe a try and check out more delicious effortless meal inspiration. 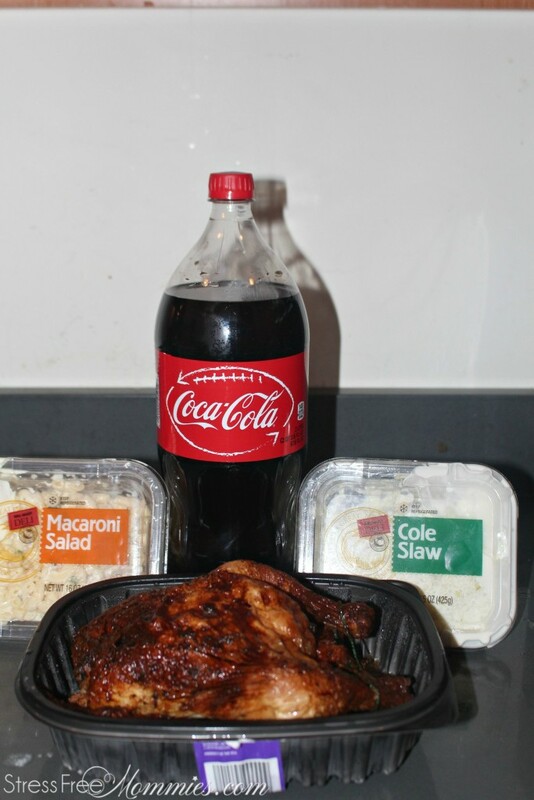 How would you pair Marketside products with Coca-Cola? What recipe will you make using Rotisserie chicken for easy dinner meals? Espero que usted da esta deliciosa receta de una oportunidad y ver más deliciosa comida de inspiración sin esfuerzo. ¿Cómo emparejar productos Marketside con Coca-Cola? Qué receta va a hacer uso del asador de pollo para fáciles comidas de la cena? Yum! I had never heard of tostones. but this whole meal looks delicious! This looks extremely yummy! Now I am not big on coleslaw but the rest looks amazing and now I am hungry! I will have to try this out for myself. Easy meals are great, especially after a long day at work. Thank you for sharing! 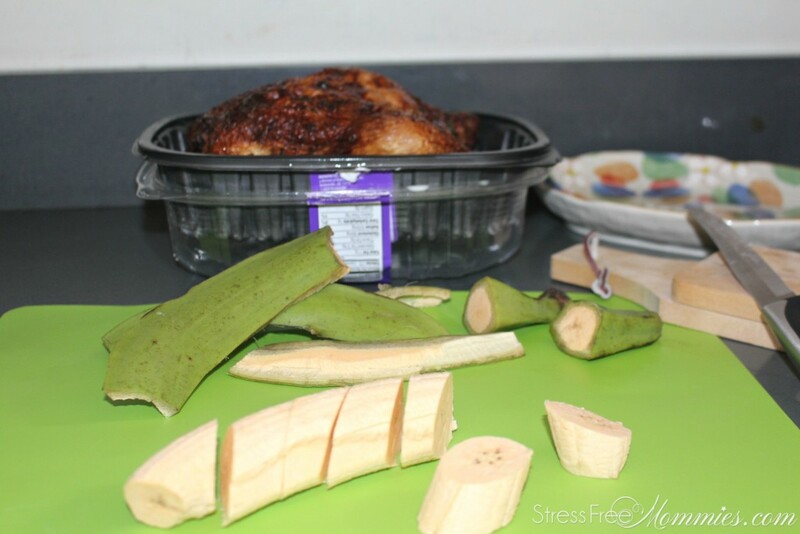 I am totally making plantains now…your post got me so hungry! I LOVE fried plantains! This looks really good! I love friend plantains. So great! That bbq chicken looks amazing! Thanks Heather! I love how easy it is to make and taste sogood with anything. Haha! yes make it, you are going to love it! Thanks Mistle! 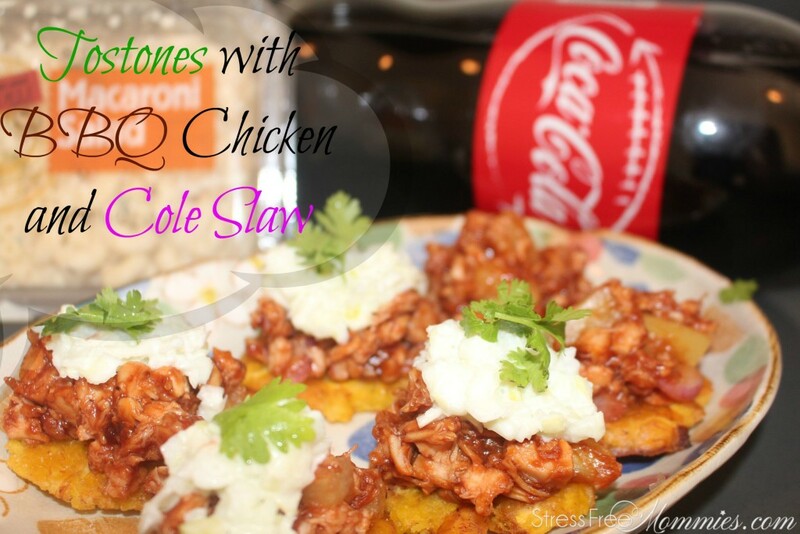 you can definitely skip on the coleslaw and it will still taste delicious. I agree with you easy meals are the best! What a yummy looking meal! It looks like a meal my whole family would enjoy! Thanks for sharing! This looks so yummy! I love easy meals, especially for busy weeknights, as we have after school activities 4 nights a week. I love plantains and the way you made them into stables. Thanks for the idea. 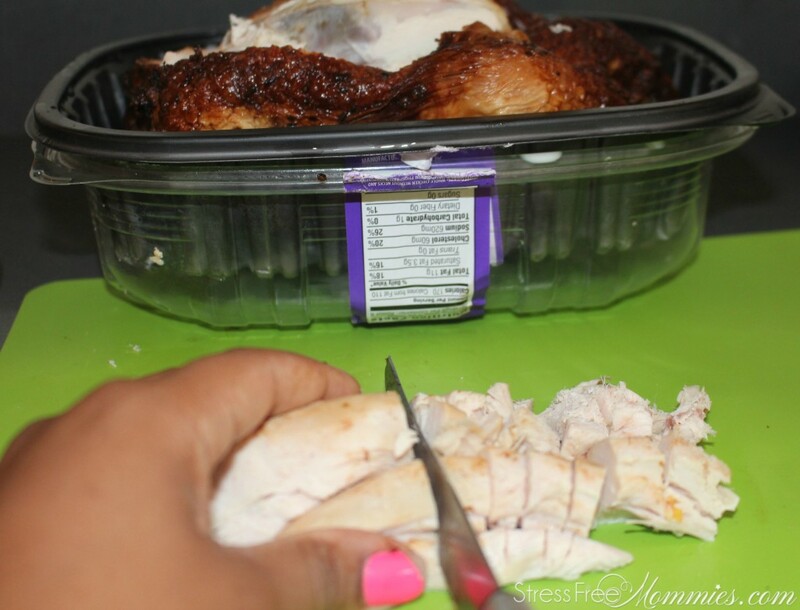 I’ve always heard about buying/using a fully cooked rotisserie chicken for quick meals. What a great idea! That must save so much time. I’m all about any form of bbq chicken so I approve haha. Becki S recently posted…Sitting Is The New Smoking! Thanks Becki! go to rotisserie chicken are great and you can put together a meal in no time. Kat | curlsnchard.com recently posted…August on Instagram & a Surprise Trip!